After allegations of sexual misconduct by professors in Concordia’s English Department were made public, students hope to see improved training to prevent sexual misconduct and abuse by teachers in positions of power. On Feb. 28, students came together in the university’s LB Atrium to hold a congress on sexual violence. Hosted by the Concordia Student Union and student association representatives from the Arts and Science Federation of Associations, the event aimed at providing students with an opportunity to openly discuss the university’s current sexual violence policy. There, organizers drafted a training proposal, which included that consent and sensitivity training be mandatory, and voted to send it to the university. The congress also addressed the D- rating Concordia received on their sexual violence policy by a national student group, and opened up a space for students to propose solutions on how to address future sexual violence issues on campus. The topic of Concordia’s sexual violence policy was another recurrent theme. Our Turn, a national student movement focused on addressing sexual violence on campuses, graded Concordia’s sexual violence policy with the lowest grade in the country. Built by Carleton University students in response to their discontentment with Carleton’s sexual violence policy, Our Turn has been calling out universities across Canada for a lack of accountability and for not properly addressing sexual violence on campus. As part of their movement, Our Turn went through various university sexual violence policies and graded them. The grading was based on a number of factors including access to the policy, mandating sexual violence sensitivity training and available support committees. Connor Spencer, the Vice-Chair of Our Turn’s national committee and Vice-President of the Students’ Society of McGill University, said the movement was an influential force behind the 2018 budget announcement—and threat—to universities which says universities need to implement sexual violence “best practices” by 2019 or risk losing federal funding. 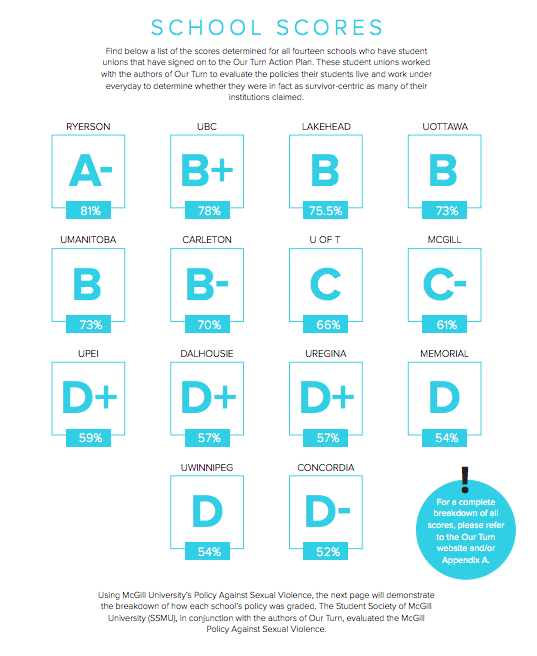 Ryerson received the highest grade with an A-, McGill received a C- and Winnipeg University received the second lowest grade in the country, a D.
Students at the congress voted to propose Concordia adopt Our Turn’s sexual violence policies, which take a survivor-centered and gender sensitive approach, and work towards creating a culture of consent on more campuses. Sutherland also said they were excited to hear students talking about having another congress in the future. “I was really impressed with CSU and encouraged by the direction of discussion and resolutions passed,” said Spencer. “Concordia has a lot of work ahead of it but after the congress, I have no doubt that the students will mobilize effectively within their communities and against the administration to ensure a safer campus in the future,” said Spencer. Shepard and Mary-Jo Barr, Concordia’s spokesperson, denied the student’s claim of disinterest in sexual violence training. 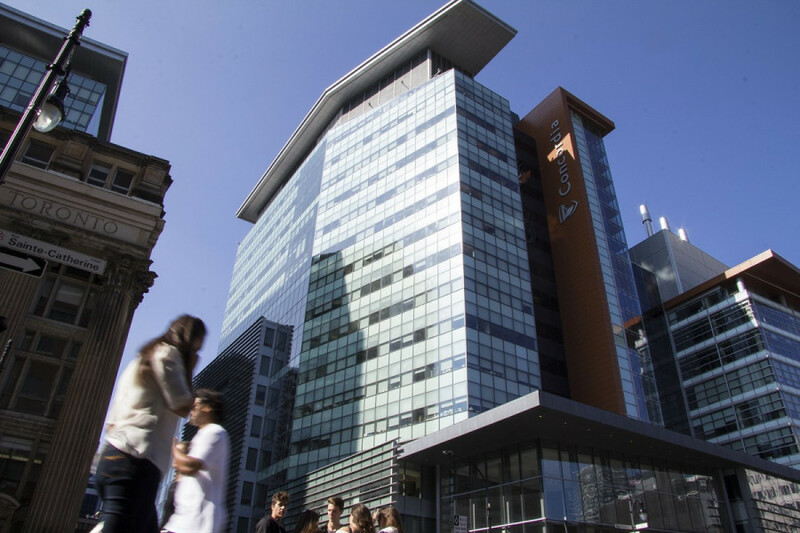 Shepard wrote through email that Concordia is reaching an “increasing number of people” each year through their Sexual Assault Resource Centre and consent workshops. He also said that they were pleased that the provincial Bill 151 now makes training compulsory for faculty and staff, and said the university is currently developing content for the training. “We would not penalize students for speaking up about assaults or sexual violence. This would be contrary to our values and policies,” wrote Barr in an email. Barr also said any student who feels they have been “penalized” should contact the university’s ombudsperson or the Office of Rights and Responsibilities.